"What if I fall?" 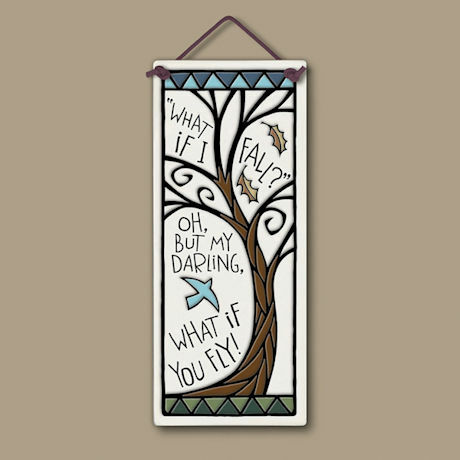 "Oh, but my darling, what if you fly!" Let someone know you believe in her (or him). Crafted by hand in the studio of Shell Lake, Wisconsin potter Michael Macone in the tradition of American art pottery, confidence-building plaque is etched, hand-glazed, and kiln-fired twice. Fade-proof and weather-resistant, it comes on a sturdy hanging cord. 3½" x 8½". Made in USA.